...Arguably the most serious charges are three counts of espionage in violation of the Uniform Code of Military Justice. The first count alleges that in March 2005, in or near Manama, Bahrain, Weinmann did "attempt to communicate, deliver or transmit" classified information relating to national defense to "a representative, officer, agent or employee of a foreign government." 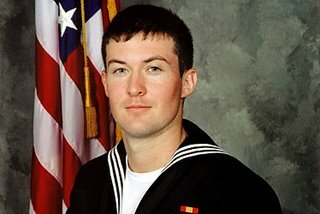 The two subsequent charges allege that months later - after purportedly deserting his Connecticut-based submarine - Weinmann did "communicate, deliver or transmit" information classified as confidential and secret to a representative of a foreign government. According to the charges, those events occurred in Vienna, Austria, around Oct. 19, 2005, and around March 19, near Mexico City, Mexico. Weinmann was picked up at the Dallas/Fort Worth International Airport days after the incident in Mexico, according to the charges. Let's face it; the odds that a young kid could successfully travel around the world trying to peddle secrets without running afoul of an American counterintelligence agent are fairly low (as shown by his capture); it'll be interesting to see if he actually delivered whatever secrets he had (since he's an FT, the immediate assumption is some sort of TLAM targeting data) to a foreign agent, or if all of his meetings were with Americans pretending to be foreigners. According to the navy, Weinmann was apprehended on March 26 "after it was learned that he had been listed as a deserter by his command." Though initial information released by the navy makes no mention of it, Al-Watan reported that he was returning from an undisclosed "foreign country." American sources close to the Defense Department told Al-Watan that Israel was the country in question. I suppose it could be Israel, but I doubt it, especially since the Navy is saying he returned from Mexico City when he was arrested -- no doubt the Saudi paper is basing their information on the Sailor's name. Ancestry.com says this about the surname "Weinmann": German and Jewish (Ashkenazic): occupational name for a viticulturalist or wine merchant, Middle High German wīnman, German Weinmann. When he gets to Leavenworth, though, he might as well be named "Pillowbiter" -- traitors don't do very well there, I've heard. So he has that to look forward to as he's thinking about how his money-making plan didn't quite work out like he expected. According to the charges against him... While still stationed on board the sub... Weinmann tried to sell secret information to a foreign country in Bahrain. That was in march of 2005. Two months later, investigators say he started copying confidential and secret information on board, possibly putting it on a navy laptop. This happened for two months. Then he and the computer allegedly disappeared. A month later, investigators say he showed up in Vienna, Austria, giving the information to a person "not entitled" to have it. He was back there again on October 19th, when according to the charges, he did give the information to a foreign government. His travels apparently continued the following year. In March he allegedly headed to Mexico City, where again the information was given to a foreign government. The navy says in the same month he traveled back to Vienna and destroyed the navy computer. He was arrested at the airport in Dallas, and brought here to the brig at Naval Station Norfolk, where a source says he is talking to investigators, and trying to avoid a potential life sentence. Navy officials say Weinmann visited Bahrain, Austria and Mexico, but they aren't saying if he was dealing with those governments. But a source tells us, one of the countries involved is Russia. The father of a Navy petty officer being held in Norfolk on espionage charges said today that his son, Ariel J. Weinmann, deserted the service last summer and lived for months in Vienna, Austria, after becoming disillusioned with the work his submarine was performing. Weinmann said he is worried that his son is “a pawn.” Weinmann said he urged his son through e-mails and international telephone calls to turn himself in after he went missing from the Albuquerque, a Connecticut-based nuclear submarine. But he doubts that Ariel was trying to sell classified information that would damage the U.S.
“It’s entirely possible that somebody got to him and manipulated him, but he was raised with a high sense of morals,” Weinmann said. See, Dad, that's what sets submarines apart from other parts of the Armed Forces; we do give young kids "really serious information" -- and hold them responsible when they don't take care of it (or try to sell it). The father has a point that the kid hasn't been convicted yet; still, what evidence we're seeing is fairly persuasive. The dad should maybe wonder how the kid came up with the money to live in Vienna for several month if he wasn't selling secrets. Robert Weinmann says he and his wife were startled when Ariel told them in October 2002 that he planned to join the Navy in July after he graduated from high school. Interested in art, classical music and history, Ariel "was very idealistic and spent a lot of time daydreaming about the great things he would do with his life," Weinmann says. After hearing the pitch from a recruiter that he could see the world if he joined the sea service, "Ariel was very focused and excited about the Navy," his father adds. Ariel Weinmann was trained as a submarine fire control technician, whose job is to help track targets in the vessel's command center, and was then sent to the USS Albuquerque, based in Groton. The nuclear-powered Albuquerque is one of the Navy's fast-attack submarines, armed with torpedoes and cruise missiles. The sub can also creep close to shore to infiltrate special operations commandos or intercept electronic communications on land. Robert Weinmann says his son did well in submarine training, but after a six-month tour aboard the Albuquerque in waters off Europe and the Middle East "he just got disillusioned" with the Navy and the Bush Administration's foreign policy. Weinmann says his son complained that the submarine's technology was old. (While commissioned in 1983, the Albuquerque is still considered by the Navy to be the most advanced vessel of its kind in the world.) Weinmann says his son also told him he became troubled by the submarine's collecting intelligence on U.S. allies, although he says Ariel never gave specifics. I'm not sure who in the Navy is saying that the Albuquerque is the "most advanced vessel of its kind in the world", unless "its kind" includes only ships named Albuquerque. Don't get me wrong; there's nothing wrong with the boat, it's just that it's not any better or worse than the other re-fueled 688s. The dad's mention that his son became "disillusioned with Bush Administration's foreign policy" part is almost certain to turn him into a hero of the moonbats, though. I'm experiencing eerie chills from this story--because a similar thing happened to a former nuke machinest mate on my boat. I had been his Div O, and he had been one of those bright, hot-running nukes who we brought up from the engineroom to help with plotting when we were "on station" for our mission. Turns out he was writing Latitudes & Longitudes in his notebook--as well as other sensitive information. ...well, you know how such things end (and they usually involve some guy named Bubba, LOL). SO, as I say, this story is eerily familiar. I had personal experience with Weinnman as I was his FT "A" School instructor. He was a troublesome student, but this blows my mind. His integrity was in question due to going UA for the weekend to see his girlfriend at school. He might of had all the wrong intentions, but I also do not think he is capable of pulling off such a plan for as long as reported. Russia makes a lot more sense than Israel, considering the type of info that he had access to. I bet most people would flip if they knew the kind of information young 19 and 20-year old MTs were entrusted with. Being disillusioned with a career in a submarine means either transferring to another service or specialty or going through the process to get discharged however worded. It doesn't include shopping US military secrets to inimical foreign governments. Not navy or a nuke, but my dad is. Suffice to say he agrees this dude, whether a "kid" or not, should get the harshest punishment possible. By the way, is it me or does it seem like Russia is turning up more often than any other foreign government for trying to get military secrets? My dad had a shipmate who tried to sell secrets to Russia as well. Don't tell me we consider this country an ally. Either the father has never been in the military or he is just trying to CYA his son's rear. As a young (21) PNSN (yes they let us on subs a long time ago) I was indoctrinated into various security programs that allowed me to see damn near everthing the CO did, if I had the need to know. What I did get to see was interesting, but I knew that I never breathed a word of it outside our Ship's Office. After 23 years of service, today people ask "What did you do on a sub?" Basic answer is poked holes in the ocean. If this kid did what he is accused of, he needs to sit his rear in prison from the day he is convicted until the day he goes to meet his maker. Hopefully he won't be put into some prison where he is only let out of his cell 1 hour a day. Send him to Leavonworth, there will be one hell of a blanket party nightly. Israel has two or three nuclear subs and has contracted for a number to bring it to five. It agreed to not arm them with nuclear weaponry. But it has been trying to obtain the technology to do so. Israel very much wants the technology young Weinmann worked with. It is their top technology goal at the moment. My bet is that the foreign government is Israel. Besides what other government would the officials of this administration protect? There are more Israeli spies than Al_Qaeda operatives. Their Lobby is alos being investigated. Israel is not an ally. This guy is a loser and sounds like his Dad is to. Hope he has to serve every day. North Korea Claims Capture Of U.S. "Submersible"